Uvesen is a Norwegian duo of percussionist Børre Myklebust and the highly prolific Andreas Brandal who has been releasing challenging and transcendental music since 1994, racking up hundreds of releases over several projects. With Uvesen the two embark upon free-improv psych experimentation of the highest order. Deep majick drones and wild aural landscapes. Abstract, percussive textures and bowed strings mingle with wild freak-folk dances and expansive electric guitar. This music is such a beast we had to encase it in plaster for your safety. SONIC COUSIN TO: Pelt, Coltranes Robbie and John, Don Cherry’s Pan-African and Cosmic eras, Ensemble Pearl [or other SunnO))) ambient side-projects], Fred Frith, Sir Richard Bishop, Flowers/Corsano, a general VHF records vibe. God literally whispering in your ear (but maybe not whispering nice things). 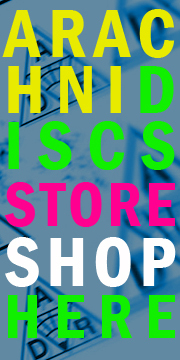 You are currently browsing the ARACHNIDISCS RECORDINGS blog archives for August, 2014.